To add the date, page numbering and additional text click the Edit Header & Footer link at the very bottom of the ‘Print Settings’ panel. This option is great if you want to include small bits of text on all hand-out pages and don’t need to include a cover page, additional paragraphs of info or even your company logo. The best way to quickly create and then edit hand-outs for your audience is by publishing straight from your PowerPoint presentation into Word. 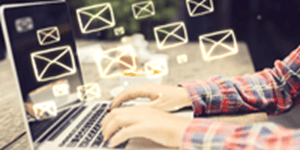 You then have the ability to format the document to fit your brand, include text, delete slides you don’t want included and include additional info like a cover page, an introduction or bio, and your contact details. 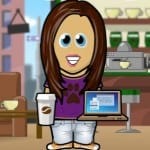 Create and save your PowerPoint presentation. PowerPoint 2013 and 2016 : From the File tab select Export. 3. Click the Create Handouts button on the right of the screen. 4. Select a suitable Page Layout option. 5. Select Paste or Paste Link and then click OK. 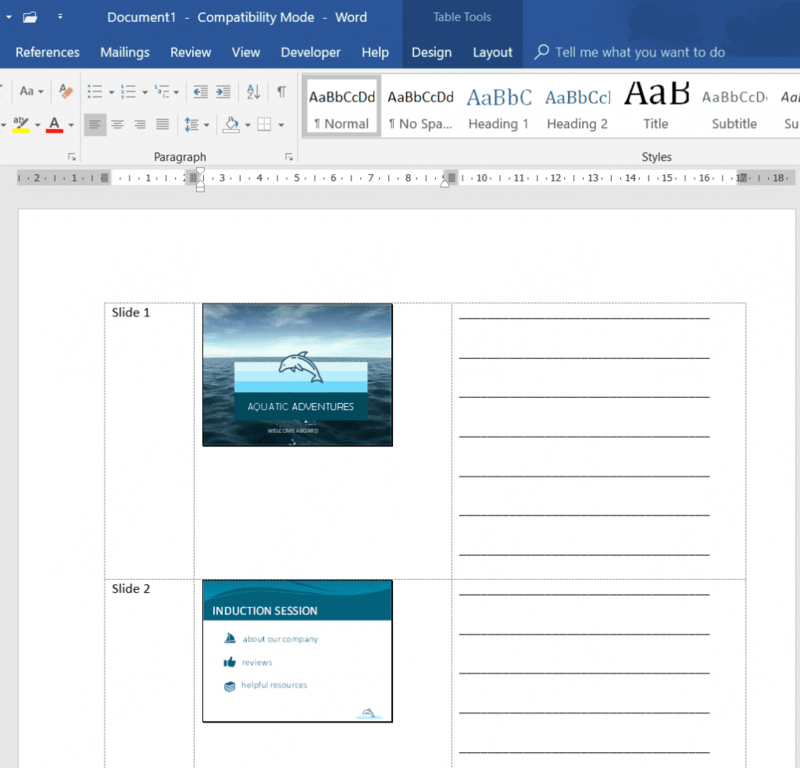 The hand-outs will automatically be generated into Word. The slides will be laid out within a table so if you are familiar with tables you can easily resize and reformat the columns and rows. You can also insert your company logo and contact details , additional paragraphs of text and additional formatting if required. Once you have made the necessary updates save the Word document. Note: In step 6 select Paste Link if you would like the Word document to update when you make adjustments to the presentation in PowerPoint. 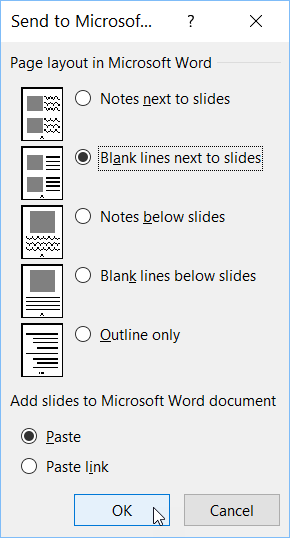 To update your slides in Word just right-click one of the slide thumbnail pics and select Update Link. Creating audience handouts is included in our PowerPoint Professional Presentations course.